In Bible times people wore sandals so foot washing was the first thing they would do before entering a tent (house). Mostly the host would provide the water for foot washing, but in some cases a servant would wash feet. 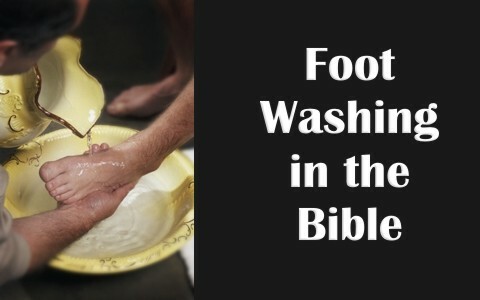 Let’s take a look at what the Bible says about foot washing. (To Abraham) Genesis 18:3–5 And said, My Lord, if now I have found favour in thy sight, pass not away, I pray thee, from thy servant: Let a little water, I pray you, be fetched, and wash your feet, and rest yourselves under the tree: And I will fetch a morsel of bread, and comfort ye your hearts; after that ye shall pass on: for therefore are ye come to your servant. And they said, So do, as thou hast said. (By Lot to the Visiting Angels) Genesis 19:2 And he said, Behold now, my lords, turn in, I pray you, into your servant’s house, and tarry all night, and wash your feet, and ye shall rise up early, and go on your ways. And they said, Nay; but we will abide in the street all night. (In Rebekah’s brother’s house) Genesis 24:32 And the man came into the house: and he ungirded his camels, and gave straw and provender for the camels, and water to wash his feet, and the men’s feet that were with him. John 13:16–17 Verily, verily, I say unto you, The servant is not greater than his lord; neither he that is sent greater than he that sent him. If ye know these things, happy are ye if ye do them. (In Joseph’s house) Genesis 43:24 And the man brought the men into Joseph’s house, and gave them water, and they washed their feet; and he gave their asses provender. (In the Old Man’s house) Judges 19:21 So he brought him into his house, and gave provender unto the asses: and they washed their feet, and did eat and drink. (To David and his servants by Abigail) 1 Samuel 25:41 And she arose, and bowed herself on her face to the earth, and said, Behold, let thine handmaid be a servant to wash the feet of the servants of my lord. (To Jesus) Luke 7:44 And he turned to the woman, and said unto Simon, Seest thou this woman? I entered into thine house, thou gavest me no water for my feet: but she hath washed my feet with tears, and wiped them with the hairs of her head. Why Did Jesus Wash the Disciples’ Feet? John 13:3–5 Jesus knowing that the Father had given all things into his hands, and that he was come from God, and went to God; He riseth from supper, and laid aside his garments; and took a towel, and girded himself. After that he poureth water into a bason, and began to wash the disciples’ feet, and to wipe them with the towel wherewith he was girded. John 13:14–15 If I then, your Lord and Master, have washed your feet; ye also ought to wash one another’s feet. For I have given you an example, that ye should do as I have done to you. In Bible times foot washing was necessary because folks wore sandals and they did not have paved roads. The sand from the road would make for some pretty filthy feet. In fact, the feet were considered to be the dirtiest part of the body. For this reason it was customary for a host to offer water for visitors to wash their feet when they entered the home. In some cases a host’s servant would even wash the feet of the guests as they entered the home. Jesus used the example of foot washing to teach his disciples the importance of service to others. He encouraged them to never consider themselves to be “too good” to serve others. Tagged as: foot washing, servant, service, What Would Jesus Do? Good article Pam. Our church does an annual footwashing and the lessons of humility on the one being washed and the one washing the feet is not lost in Jesus’ example. Previous post: How Were People Saved Before Christ And The Cross?